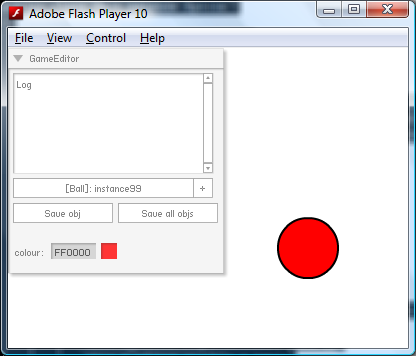 A few days ago I came across the method of conditional compiling in Flash. If you're from a C or a C++ background, you'll probably be familiar with the #define and #ifdef directives. They're most common in a multi-platform engine and usually found deep in the math or render code. They can be highly useful and let you develop specific code depending on how the variables are set up. Up until recently, I didn't think it was possible to do this through Flash. If you're using the Flash IDE, you can add it by going through the File > Publication Parameters, hit the Parameters button beside ActionScript 3.0 on the Flash tab, then add your constant in the Configure Constants tab. As you can see, Flash defines a CONFIG::FLASH_AUTHORING for you if you need to target it specifically for something. Also, my Flash IDE is in French; one of the side effects of living in France. See the amazing benefit yet? Practically, this is incredibly useful if you're making something like a game. Level editors, cheat codes, the ability to skip levels, test functions, change scores, change properties etc, can all be enabled during Debug mode. Then, when you switch over to Release mode to release your game, all of that is magically removed. There's no need to remember to disable everything when you're finished: in the Release SWF, it simply doesn't exist. There's no worry that somebody might discover the cheat codes you added for testing and destroy your game; they don't exist any more. Want to make sure that someone can't set a property for an object (say, by hacking the SWF)? 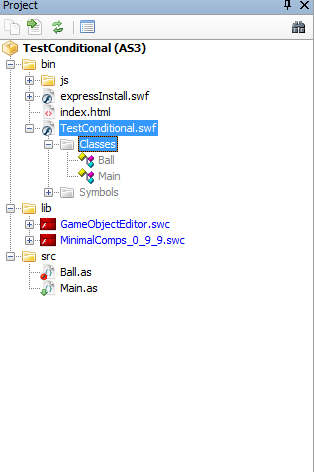 Conditional compile out the contents of the setter. If you've ever tried to make money from your game, you'll know all about implementing 100 different versions of Ad serving, highscore tables, event tracking, site-locked content and other paraphernalia. There's no need to keep 15 different projects with all the different changes. Conditional compile it and not only is it a simple recompile to make your changes, but other versions don't include the different libraries that you're using. For example, Kongregate don't show Mochi ads, so why should that SWF include the lib? If you want to connect to the Kong chat, why should the other SWFs need that code in there? And you'll be fine. You can ignore the import statement, as Flash strips out all imports that aren't used in the file. i have to use CONFIG::DEBUG instead of CONFIG::debug , which produces syntax error at my side. 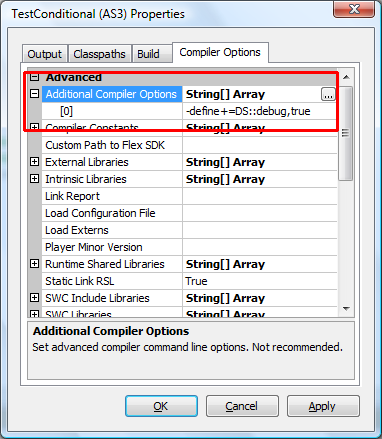 why not simply use the "Compiler Constant" entry right below the "Additional compiler Options" ? is there any difference ? I'm wondering if such a solution could be used with the FLASH IDE. 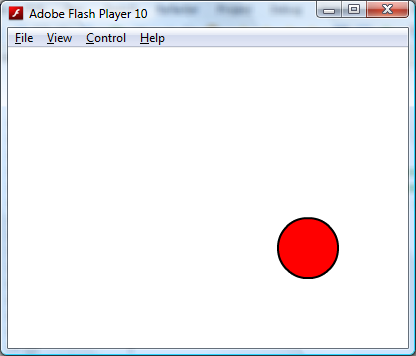 I use Flash Develop to do all the ActionScript 3, but I still have to use Flash IDE for all the graphics-heavy part. I really could use conditional compiling, but I don't think it's really possible, unfortunately. Does anybody have an idea about that ? This is easily done in the Flash IDE if you want to use it. I've updated the post with the steps to get it done. Have fun! 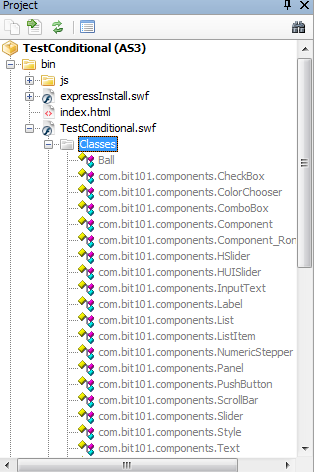 Is there any way to make it so that the Flash IDE can see the config constants that FlashDevelop has declared? For example I, like the poster above, use FD for code and FlashIDE for graphics. 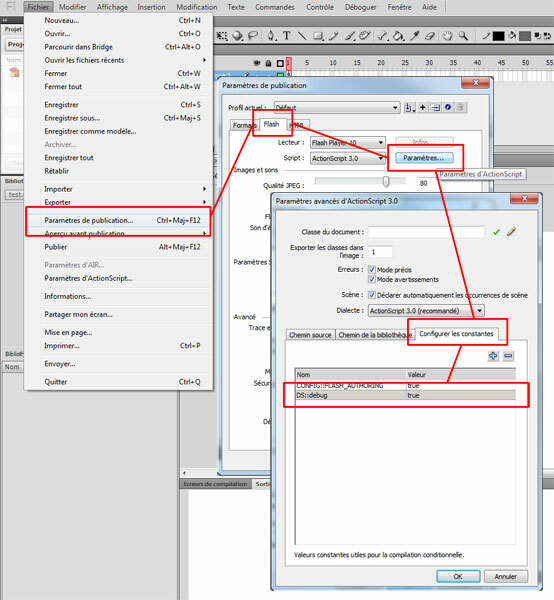 Currently if I wanted to switch between 'debug' and 'release' in FD, then i would also have to reflect that change in the FlashIDE adding in extra steps and the convenience of just changing the drop down box in FD. While Flash lets you load a custom publish profile from a XML, and FD can accept a config XML file, they aren't the same format. You'd need to create a small tool which would update both XML files when you wanted to change a compile constant. And in any case, you'd need to reload it into Flash; it doesn't recognise when the XML has changed, so it's more trouble than it's worth. You'd need to keep changing it manually. Do you need to have the constants in the Flash IDE? When you say you use Flash just for graphics, it shouldn't need any compile constants. Are you compiling through Flash, or FD? Indeed, very useful. One I added is CONFIG::editor, independent from debug or release, and in this way I can have a quick optimized editor. The only problem is that they mess FlashDevelop's code recognition!! and autocomplete stops working on some variables, functions, classess... It doesn't matter if I put the definition in "additional compiler option" or "compiler constants" - FD can't grok them. Or at least so appears at first sight... perhaps someone found some magical checkbox in options, plugin or whatever that will bring back autocomplete?